Work on the new visitor centre and removal of the old road that ran next to Stonehenge in Wiltshire is progressing, and as we were in the area at the weekend, it seemed worth stopping for a look. 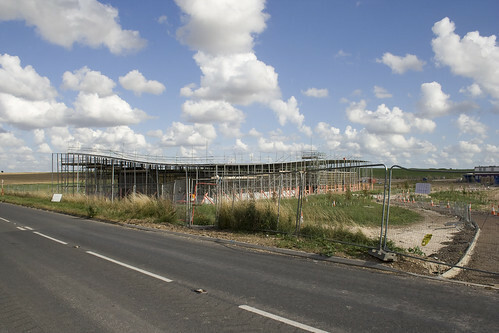 The new remote visitor centre roughly 1.5 miles away from the Henge itself is now sprouting upwards as a sea of steel supporting its slender roof. In the future, visitors to Stonehenge will have to stop here and take an approved mini-bus service up to the stones themselves. Here, the background vista of a local field covered in cars, and a car park filled with coaches will be banished to a dream-like vision of the past. Much like most of Stonehenge itself in fact. 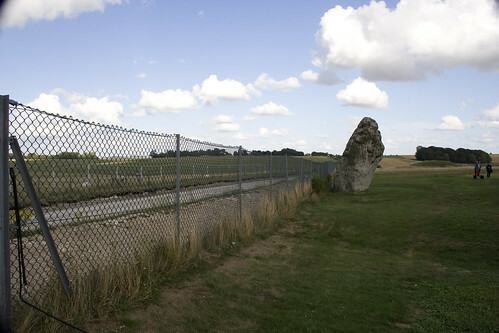 The biggest change though is the local road that ran perilously close to a major stone from the Henge and has now been closed and workers have started to tear up the tarmac to return it to grass. The intention so famously desired is to return the Henge to a more rural idyll without the messy trappings of modern life. I am however somewhat iffy about this possibly revisionist vision of the Henge. While its function is unclear, it certainly would have been an important location — and important locations attract important people to visit them. Would Stonehenge really have sat in the middle of an empty field? I’ve pondered this and I just don’t feel comfortable with the idea. Would Parliament and Westminster Abbey have been built in the middle of a field without any support facilities around them? It is known that Stonehenge had Neolithic huts on the site, and potentially quite a large village would have built up, often very close to the Henge itself. Just as someone approaching a Medieval Cathedral would have passed through a noisome mucky market right next to the Church, would an ancient lord have approached Stonehenge assaulted by the odors of cooking, sewage and the like? Maybe our idyllic vision of the Henge in the middle of a venerable landscape untouched by the debris of human life is as misplaced a concept as the idea of modern day druids? That is not to say I don’t like the plans, but as in all things historical, maybe we need to think about the reality as opposed to our poetic vision. 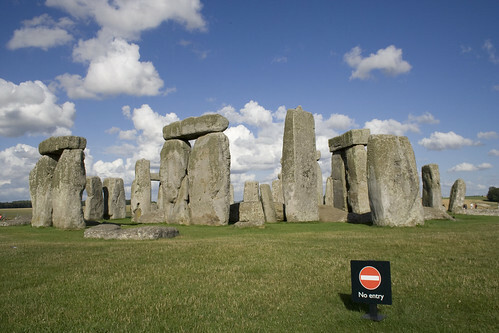 Of course, in order to preserve the sanctity of the land, you also have to stop people going up to the Henge itself. This is one of the more controversial aspects as any time I mention the venue, there will always be someone who comments on how they always used to be able to go amongst the stones, and what a pity that isn’t allowed anymore. A large part of the appeal of a pile of stones in the ground isn’t what they are, but what they represent, and in that regard, some of the mystery needs to be preserved. Most of the people who talk about the good old days of wandering amongst the stones did so at a time when hardly anyone visited them. A dozen people wandering around a small stony enclosure is tolerable, but when you have a dozen-hundred people doing it — less enjoyable. What people really mean by wanting to go into the stones is for them to go in, but not the several hundred other visitors to be in there at the same time. If you want a vision of that the place would be like if it was a free-for-all, then turn up on the Soltice, when you are allowed inside — along with every single other visitor to the site. As it happens, you can go inside the stones, in the evening on a private group visit — and having done it myself, that is indeed a wonderful experience. The whole site devoid of tourists and just your own little group inside the stones. It’s a magical experience that retains its magic because in part it isn’t a common occurrence, and in part because you aren’t jostling in a tube-train packed space with a load of random strangers all struggling to get that perfect photo. Medieval churches separated the ordinary folk from the altar by means of a Rood Screen to keep some of the magic intact. 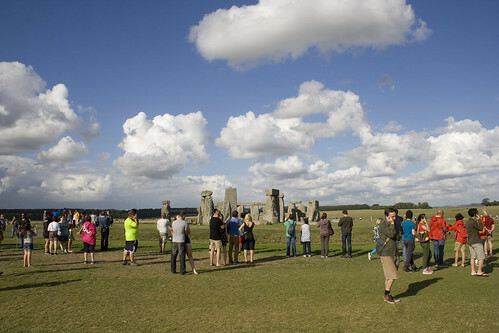 Stonehenge has a rope running around the stones — its own secular rood screen. If you want to hug a stone, go to Avebury. Pubs there too. I’ve been to both Stonehenge and Avebury. Avebury was great not only because I could touch the stones, but also because even on a Bank Holiday weekend, it wasn’t full of thousands of people. There is no evidence of Neolithic hits on the site. I think you’ve confused it with Durrington Walls, 1.5 miles away to the northeast. When I was a small, carsick child, Stonehenge was a landmark on the way to visit my aunt, and always worth pointing out. I believe I visited it once from boarding-school, back in the wandering-among-the-stones days, but have only a vague memory of doing so; I did visit some years ago with an American friend who longed to see it, but it was in November so the ravening hordes weren’t too ravening, and walking round on the paths designed for the purpose gave us all the view we wanted. And we saw a sparrowhawk being mobbed, which was even better! 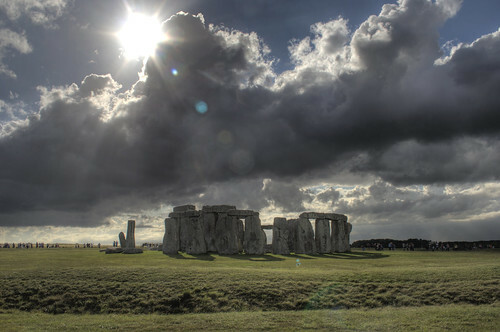 I am not sure one can quite discipline Stonehenge in the way the planners wish – it is more than the sum of its parts! I love being able to pass by Stonehenge on the A303, especially when it’s misty. I do however prefer the intimacy of Avebury. Be aware the traffic jams can be bad travelling east towards Stonehenge. A 90 min journey on Sunday took 3 hours with long stops well before Winterbourne Stoke right past Stonehenge. The traffic suddenly cleared where the road now closed meets the A303.